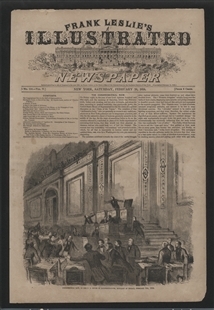 After the House failed to expel Matthew Lyon for the “gross indecency” of spitting tobacco juice at Roger Griswold, the latter sought justice by attacking Lyon on the House Floor (then located in Philadelphia’s Congress Hall) with a cane. Lyon defended himself with a pair of fire tongs. 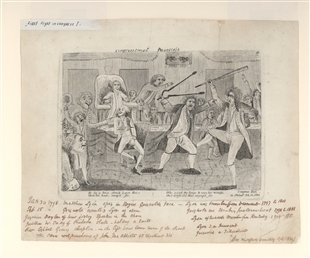 Commemorating the row between Representatives, this 1798 etching includes verse describing the scene, including the detail that Lyon “seized the tongs to ease his wrongs.” Following the tone of the simplistic rhyme, the grotesque, laughing faces (including that of Speaker Jonathan Dayton), and awkward, exaggerated poses further reinforce the absurdity of the situation.